← Who Are Those Guys in the Header? All creatures have dreams – even hunchback monsters, it seems! 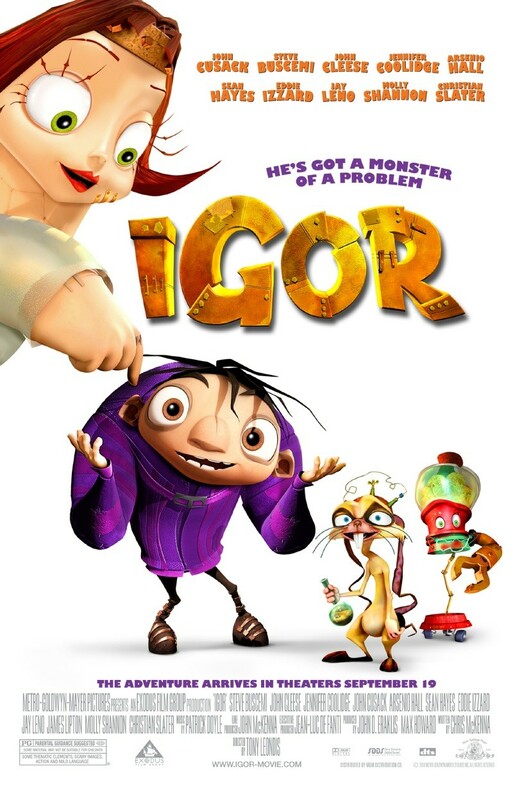 Igor is no different – he’s a young hunchbacked monster who dreams of becoming a scientist and winning first place at the annual Evil Science Fair. The problem? He’s only a lowly lab assistant who’s job is to do everything that him mad scientist employer tells him to. The final poster for Igor was recently released, showing off the full cast of celebrities whose voices you will hear in the film beginning September 19th. John Cusack provides the voiceover for the main character, Igor. This unique take on the traditional ‘monster movie’ should be well-received by young audiences worldwide. It is rated PG. This entry was posted in Actors, cartoons and tagged Arsenio Hall, Christian Slater, Eddie Izzard, Exodus Film Group, Igor, James Lipton, Jay Leno, Jennifer Coolidge, John Cleese, John Cusack, mad scientist, MGM, Molly Shannon, monster movie, Paul Vogt, science, Sean Hayes, Steve Buscemi. Bookmark the permalink.